We can represent a particular floating point value as either a decimal floating point number or a binary floating point number. Below is an example of how we would convert a decimal floating point value (3.25) to its equivalent binary floating point value. 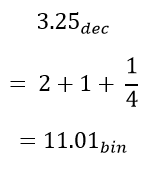 This particular example was rather easy, because the decimal value 0.25 represents 1/4, so can be represented as a binary fraction with only two digits after the decimal point. The decimal value 1.1 is a bit more difficult to calculate. At each step, we find the largest fractional power of two (e.g. 1/2, 1/4, 1/8) that is smaller than the remaining fractional value. We then subtract that value and continue. 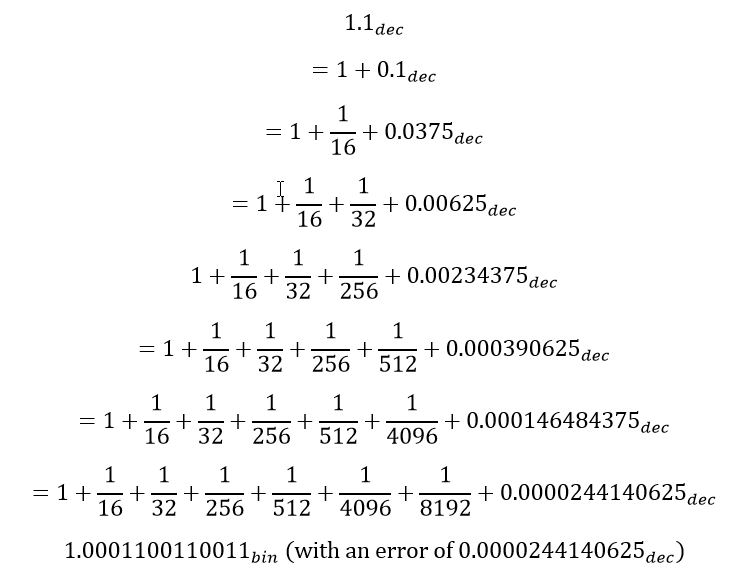 We could continue this process, adding one digit of precision at each step and reducing the error–the difference between the binary representation and the value 1.1. In the end, we can’t exactly represent this value with a binary floating point number.